The Budweiser Sky Ball Flyaway Sweepstakes is open to residents of the United States (except Alaska and Hawaii) who are 21 years of age or older. 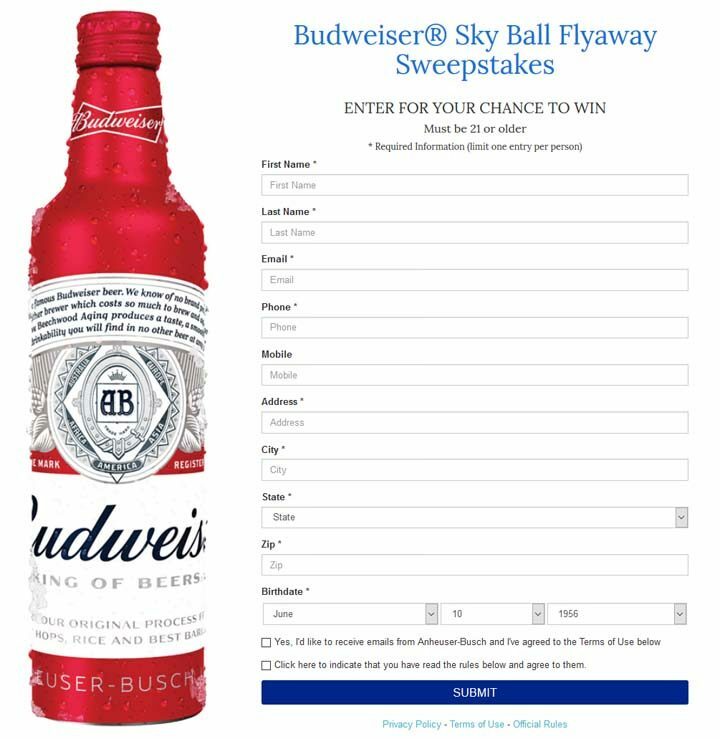 The Budweiser Sky Ball Flyaway Sweepstakes ends at 11:59:59 p.m. CDT on October 10. During the period, visit skyball.absweeps.net and follow the online instructions to complete and submit an online entry. Winner will receive two (2) tickets to attend the American Sky Ball events scheduled to occur on November 10 and November 11, in Dallas, Texas; hotel accommodations for three (3) consecutive nights (November 9, November 10 and November 11); and up to 120,000 frequent flyer miles which may be used towards travel to Dallas, Texas for winner and one (1) guest. Approximate Retail Value (“ARV”): up to $6,920.00. Total ARV of all prizes: up to $13,840.00.